Our students need to be comfortable with the information technologies that are inextricably linked to the 21st century skills the work place requires, and teachers need to help pave the way. A May, 2013 Gallup Study, summarized in this article, “In the U.S., 21stCentury Skills Linked to Work Success”, indicates that young U.S. adults who say they developed 21st century skills in their last year of school are more likely to self-report higher work quality. In 2006, the Partnership for 21st Century Learning published a report titled, “Are They Really Ready To Work? Employers’ Perspectives on the Basic Knowledge and Applied Skills of New Entrants to the 21st Century U.S. Workforce“ (Partnership for 21st Century Skills). This is one of many studies and reports published in the last 5 to 10 years that emphasize business’s requirement for 21st Century Skills that are increasingly being applied using today’s information technologies. Year over year, the requirement for these skills has continued to expand as businesses and the general population increasingly adopt a wide variety of digital technologies. The ability to communicate effectively orally and in writing (with almost all of today’s written communications in business being conducted digitally). Teamwork skills and the ability to collaborate with others in diverse groups settings (and information technologies are increasingly essential to many forms of organizational collaboration). The ability to innovate and be creative (today’s information technologies empower innovate and creative capabilities in ways not previously envisioned). The ability to locate, organize, and evaluate information from multiple sources. 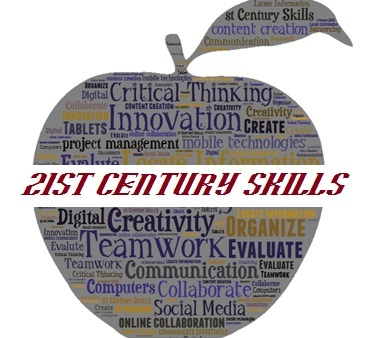 What are “21st Century Skills”? Clearly it has never been more important for schools to provide students exposure to the information technologies that will prepare them for successful entry in to, and thriving careers in, the present day work place. In order to do this, our teachers need to be comfortable with a wide variety of technologies, yet many schools across the country and the world at large have been slow to accept and embrace this vital skill set. Of course, the fundamentals of reading, math, etc., absolutely and undeniably come first, but technology skills are now an essential part of the overall mix. What is your school doing to prepare students for the 21st century work place? Institute of Museum and Library Sciences. “Museums, Libraries, and 21st Century Skills.” Institute of Museum and Library Sciences. 9 November 2013 <http://www.imls.gov/about/21st_century_skills_list.aspx>. Partnership for 21st Century Skills. “Are They Really Ready To Work?” 2006.Partnership for 21st Century Skills.<http://www.p21.org/storage/documents/FINAL_REPORT_PDF09-29-06.pdf>. Sidhu, Jenna Levy and Preety. “In the U.S., 21st Century Skills Linked to Work Success.” 30 May 2013. Gallup.com.<http://www.gallup.com/poll/162818/21st-century-skills-linked-work-success.aspx>. Washington, William. “21st Century Learning Is Not A Program.” 6 January 2013. TeachThought.com. <http://www.teachthought.com/learning/21st-century-learning-is-not-a-program/>.